I felt so blessed when I drew your name for Secret Santa. I have wanted to do something nice for you for so long, and now's my chance! The best part is, you have no clue who I am - ha, ha. I hope you like this present I picked out especially for you. You can go ahead and open it now - no need to wait until Christmas. Don't be shocked if you find another little gift in the foyer before Christmas. 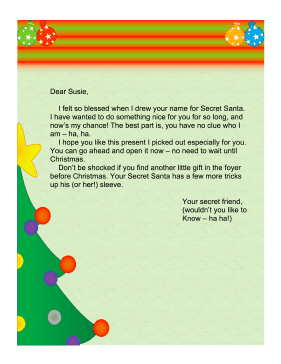 Your Secret Santa has a few more tricks up his (or her!) sleeve.